Armed gardai stormed the scene of a terrorist attack in the capital - in an unprecedented drill as the force look to up their preparation. 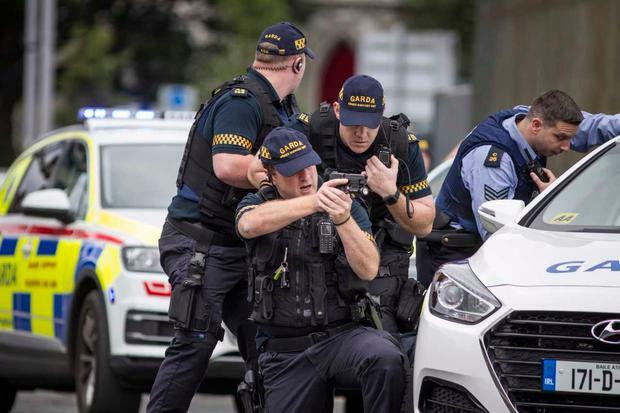 Personnel from the gardai's Armed Support Unit (ASU), Emergency Response Unit (ERU) and local gardai from Store Street stormed the scene of a random act of terror situated around a train station in Dublin's north inner city. The incident took, just outside Docklands railway station shortly after 11am, when two men in a black van sped up Sheriff Street Upper, before crashing, knocking down a woman and moving towards the station. The two men - one wielding a large knife and the other with a gun - proceeded to slit the throats of two women at the bridge by the station who had made a call to gardai. Local gardai from the nearby Store Street station arrived on the scene inside a minute of the phone call, with the ASU arriving in just over three minutes. 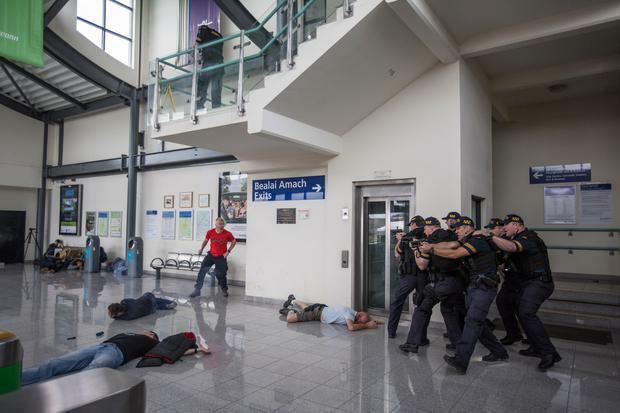 Further carnage emerged inside the station, with around half a dozen members of the public (actors) being slashed in the process. 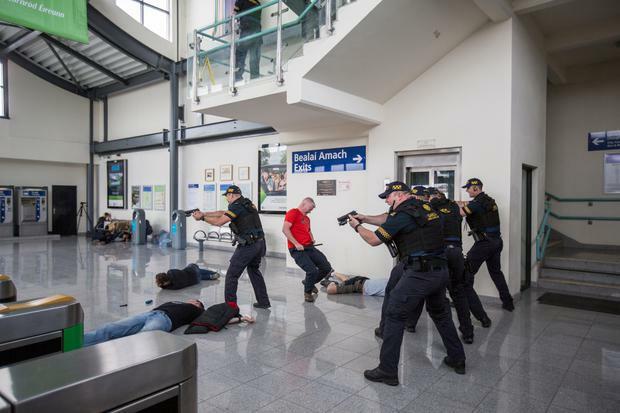 When the armed gardai arrived inside the station, one of the perpetrators was eventually shot, while a hostage situation continued on the train, before the second terrorist - armed with a gun - emerged from the train and was gunned down. Taoiseach Leo Varadkar announced that the first meeting of the new Government Security Committee will take place next week. The announcement followed the successful conclusion of the security exercise today. "Protecting our citizens is of paramount importance to the Government. This involves a significant amount of ongoing work by the Gardaí, the Defence Forces and other State agencies," he said. "Today’s security exercise is part of the ongoing work by these State agencies to practice, develop and assess our capacity to prevent or respond to incidents. Their principle focus is on security within Ireland, but they also work with our partners in Europe and further afield. Much of this work happens behind the scenes, but I also recognise that the public need reassurances about our capacity to deal with incidents. "As well as testing our response capacity, it is even more important that we do all we can to prevent attacks. We do this through our law enforcement and intelligence agencies, through international co-operation, through our foreign policy and peacekeeping work, and also through important domestic measures such as promoting integration, education, tolerance and respect here at home. "Before I was elected Taoiseach, I said it was my intention to establish a new Government Security Committee to allow greater Ministerial involvement in preparing for and managing major security threats, and to allow more extensive cross-Departmental cooperation on these issues." Gregory Harkin PUNTERS from around the globe are hoping to win a brand new Co Donegal home worth €200,000. Ralph Riegel THE sister of murdered Irish businessman Jason Corbett (39) has slated as "beneath contempt" efforts to drag his two children into the legal maelstrom in the US just to help his killers escape justice.